Princess Elizabeth thanked the Thrale family for hiding and securing her escape at Nomansland from Queen Mary between 1556 and 1558. When Elizabeth became Queen she repaid the Thrale family by giving them the family arms and a broad arrow. In ye last year or two of Queen Mary's reign (1556 - 1558) and during the persecution of Elizabeth, Elizabeth was under ye necessity of making her escape from Hatfield or Theobalds to Ashridge or from Ashridge to Hatfield or Theobalds; being pursued and nearly taken by Queen Mary's emissarys, she dismounted her palfrey or horse and escaped into the barn or house of Mr. Thrale of No Mans Land, where she was concealed for several days and escaped. As a reward, Queen Elizabeth, on coming to the throne, gave the Thrale family as a token of her regard amongst other things, arms, a broad arrow, etc. In A New Thraliana, Richard Thrale indicates that The College of Arms have no record of such a grant of arms. The time when Princess Elizabeth was in danger was during Wyatt’s rebellion, when Mary ordered Elizabeth to return from Ashridge to London. The journey would have been the only one which would have brought Elizabeth anywhere near No Mans Land, and then she would only be under semi-arrest. She was sick and was carried in a litter and passed through Redbourn where she stayed all night. She then went to St Albans where she stayed at Sir Ralph Rowlatt's house where she 'tarried all that night all heavy, feeble in body and comfortless in mind'. From there they passed to Master Dodd’s house at Mimms where they remained one night, and from thence to Highgate where she stayed at Mr. Cholmley’s house. She left Ashridge in January 1554 and arrived at London on 28 February. Rev. Ian Dunlop, author of Palaces and Progresses of Elizabeth I considers where there is smoke there is usually fire. 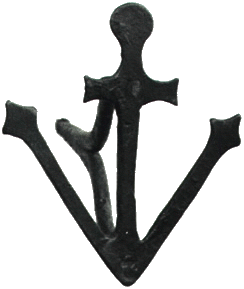 The broad arrow mark was used by the Thrale family for centuries until the Napoleonic Wars and the adoption of the broad arrow as the official government mark. Since the writing of A New Thraliana, in July 2004, it has been discovered that the 8 September 1600 will of Thomas Thrale bore his mark which was in the shape of a Broad Arrow. This is important because it provides evidence of the use of the Broad Arrow as an identifier by the Thrale family during the reign of Elizabeth I.
William Thrale of Nomansland who died in 1883, gave the Broad Arrow iron (used for marking sheep) to Vicar John Griffith, and his daughter Mrs. A S Johns lent it to the St Albans Museum where it was exhibited in the 1940s. It was later acquired by Richard Thrale and was exhibited again at the Museum of St Albans at their Centenary Exhibition in 1998. I have just realised that the relative proximity between Hatfield House - the residence of Princess Elizabeth and Nomansland Farm is only 5 miles, and this lends the story greater feasibility. Google map's walking route. Family tree for Thomas Thrale.